Hello! Welcome to Xanthicasa, a blog dedicated to cataloging life updates as well as the design & renovation progress of our new home in Portland, Oregon. The Fairmount house is progressing very quickly and is speeding towards the finish line very soon! We’re excited to share photos of the progress on other areas of the house, but for now I thought it would be great to show an update on the main level bathroom. As you may recall from the earlier posts, the main star of the bathroom is the tiled mural wall. Below you can see the approved Alexander Girard inspired tile layout as laid out on the floor temporarily. Being that the pattern is quite complicated, the tiler came up with the great idea to numerate each tile based on a printout we gave him. This surely expedited the process of getting the tiles onto the wall, and the end results really look amazing. The pattern is quite impactful, especially for such a small space as a bathroom, but we couldn’t be happier with it. “Go big or go home” as the saying goes! Complementing the mural wall, the rest of the bathroom tile is black – with black penny tiles covering the floor and black cement Clé tiles covering the side wall as well as the shower. Originally, the Fairmount house featured a large rectangle shaped glass block window that we really did not like. Personal taste aside, the glass blocks were not in great condition and had plenty of cracks and leaks and needed replacement no matter what. Initially the plan was to simply replace the glass block with a standard picture window of the same dimensions, while retaining the triangle window above the rectangle. The triangle windows (there was one on the front of the house and one on the rear) were a source of delight as well as annoyance for Jon and I. From the outside of the house, we really liked the triangle windows. They followed the roofline shape and generally looked appropriate for the house. The placement of the rectangle window, however, never really looked quite right in unison with the triangle window. Inside the house, the triangle windows really looked off, though. The ceiling inside the house does not follow the pitch of the roof line due to the necessary attic space, and as a result the triangle windows were awkwardly placed in very close proximity to the ceiling (as seen in the first photo in the slideshow below). A solution we were very close to pursuing was to create a slat feature ceiling detail to hide the triangle windows, while embracing the light they brought into the house. The plan was to align the slats to the same level as the base of the ceiling soffits, with the slat spans running parallel to the window plane, creating a volume above the slats within which the triangle windows could be concealed. It soon became clear that we had to do a lot more extensive exterior work to the house, and that was when we really began to start looking at the budget to try to find areas to alleviate some of the budgetary pressure… and the ceiling slat feature was the first to go. With the slats nixed, we needed a solution for the triangle windows, and that’s when the idea was birthed to replace both the rectangle and triangle windows with something different… and the final solution was to make it a large 5 ft round window. There she is, our new round window in all her magnificent glory. And sticking with the “Beetlejuice” theme, we love the playfulness of the new window… it almost seems like the house has an eye. So much so, that we’re going to have a large globe pendant hung perfectly centered to the window in order to make it appear as an iris. As you saw in the last post, there is currently an extensive amount of work and refocusing of effort going on with the Fairmount house exterior; but originally going into the project our main intent was to focus most of the renovation on the interior. The house was built in the early 90’s and as such there were plenty of elements that felt out of place today. The main level of the house (there are 3 levels total: you enter into the main level of the house located at the middle, the master is upstairs, and there is a pair of Jack and Jill bedrooms and extra space downstairs) is probably the part of the home interior that is getting the largest update and reconfiguring. Starting from the entrance (seen above towards the left in image 1) you originally were greeted by a foyer (?) wall which blocked the dining room behind it. To the left of the wall is the living room, and to the right of the wall is an entrance to the kitchen as well as the stairs up/downstairs and also leads into a hall taking you to the main level bathroom and a room that was previously utilized as a den (we’ll be using it as a guest room). We liked the separation of space that the wall provided, but wanted something more airy, so as you can see in images 2 and 3 the wall is being replaced. At the moment there is just a big hole leading directly into the dining room, but it will be replaced with a wooden post screen. The screen will allow for definition of the space while also allowing direct view of the dining room window as you enter through the front doors. In the background of some of the photos above you’re able to peek the previous and current state of the living room. The living room was mostly harmless, except for the fireplace. Above the fireplace was a large and ultra-contemporary bulge. Aside from housing an overhead light, it served no real purpose, and turned out to have no functional purpose… so it will be removed in favor of just a clean and flat expanse of drywall. The fireplace hearth is going to be removed in order to give a little more space back to the room – the room photographs a little bigger than it really functionally is, and taking into account the window and fireplace placement there aren’t too many furniture layout options, so removing the hearth will give back needed space and hopefully allow for a couple more layout options. Around the corner of the fireplace was a bench that housed a log storage compartment, we’re also going to remove this again in order to open up the space a little more and expand the furniture layout possibilities. The new fireplace will feature a wide band of raw metal stretching from the left of the fireplace wall all the way around into the window nook where the bench was previously. The living room is a double-height space with lots of windows providing a wonderful amount of natural light. We’ll be augmenting the space with a nice oversized pendant in the center of the room, adding extra light into the space but like the previous fireplace bulge did the pendant will also direct visual attention back up to the top of the space. Time really does fly! We’ve been in Portland now for a little over two months, and the Fairmount house has progressed quite a lot over those two months. A lot of the progress has been smooth overall, but there were a handful of discoveries and setbacks regarding the exterior that we’ve decided to look at as an opportunity rather than a problem. Originally the plan and scope for the house renovation was more focused on the interior, with a few projects concentrated on the exterior. At the start of the project the exterior work was limited to the addition of the Beetlejuice-inspired false wall on one of the decks and a full repaint. Little did we know back then that soon enough the exterior would be commanding the bulk of our attention. As a side effect of some of the interior projects and wall explorations, a lot of vulnerabilities with the home exterior were discovered. Basically the entire exterior was not weatherproofed as effectively as a home in the Northwest should be, causing plenty of issues underneath the original siding once parts of it began coming out to make way for new windows and doors. 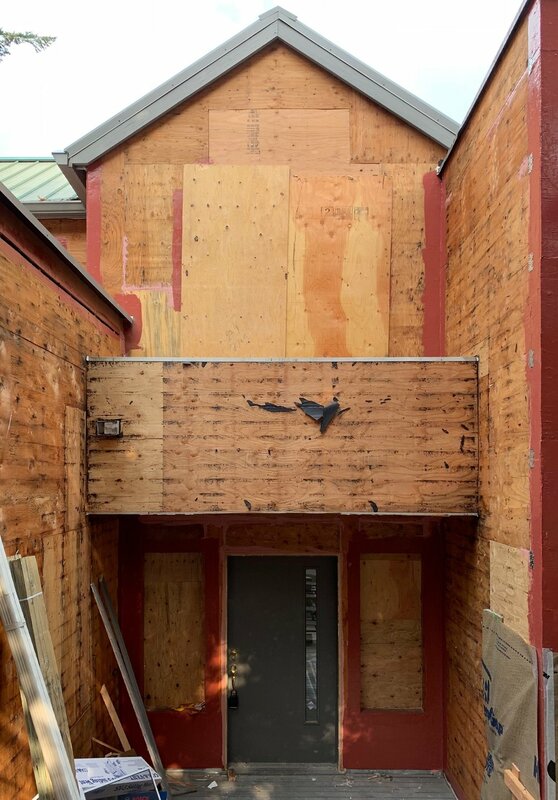 To make a long (and depressing) story short, in the end we’ve decided to get the entire exterior corrected… That means all repairs to rotting areas, new weatherproofing, new siding, and upgraded windows throughout. Insert cash register sound effect here! It really is a costly and time-absorbing endeavor that we weren’t fully anticipating to have to do or prepared to take on at this point of home ownership, but we are feeling good about it and the results so far. Our contractor Hammer and Hand are experts at home weatherproofing, so we absolutely couldn’t be in better hands. Plus once the exterior was stripped down to the plywood and all the windows removed, it really gave us the opportunity to do some customization that we otherwise may not have bothered with. Case in point, the triangle window and the glass block rectangle window above the main entrance (seen in picture 2 above)… the original plans were to keep and embrace the triangle window and replace the glass blocks with a standard rectangle picture window of the same dimensions. Now with the exterior all opened, though, we jumped at the chance to add some more character to the outside. The eventual Beetlejuice false wall on the balcony will feature a large circle cutout detail, so we decided to repeat the circle above the front entrance with a new 5 foot diameter circular window replacing both the triangle window and glass block rectangle. Above you can see a few more before photos of the exterior along with a couple of shots of the work in progress. As you can see, there is an extensive amount of scaffolding setup around the house, and it actually extends around the entire home (its difficult to get clear shots of the house due to the thick trees… but I will try to get better angles soon). The team is working at an incredible pace in order to try to beat the start of the famous Portland rainy season, and as such these photos are a little dated already! At the moment the entire house has been wrapped with weatherproof wrapping and the first bits of new siding are starting to go on. The plan is to finish up the siding one side of the house and begin painting that side while moving on to the siding on the next side, and so on and so on. The new windows should be arriving by the middle of the month, and by that point the outside will be mostly completed and ready to pop the new windows in place and touch up the siding and paint around them. We’re so excited to see the exterior all freshly painted (new color is black!) and the new windows all in place, especially that round window! It took a while (the original post was back in February! ), but we did end up making a decision on what tile to use for the guest bathroom as well as what layout to go with. Quick recap, we wanted to give a good nod to Beetlejuice in this room, but didn't want it to feel overly themed. So in the end we opted to reference the iconic black and white scheme that comes to mind with the movie, while referencing a more mature mid-century modern aesthetic for the patterning of the tile layout. Above are the two tile styles that we are going to be using. The first is a split black and white, and the second will be used in full black as well as full white. As noted in the original post, these are concrete tiles made by Clé Tile. For the layout we looked to the amazing collection of patterns created by Alexander Girard, in particular the Check Split pattern above. It is wild enough to make an impact, while at the same time also giving us that Beetlejuice reference we love so much. Below are some mockups of the tile layout, with and without bathroom elements. We're super excited to see this completed and up on the wall hopefully real soon! © 1998-2018 Raymond Sepulveda & Jonathan Valiente. All rights reserved, unauthorized use is prohibited unless otherwise indicated. All photographs, written content are the sole property of the site owner unless otherwise noted.